This article is the thirteenth in a series by Ambassador Akbar Ahmed, a former Pakistani high commissioner to the UK, exploring how a litany of volatile centre/periphery conflicts with deep historical roots were interpreted after 9/11 in the new global paradigm of anti-terrorism - with profound and often violent consequences. Incorporating in-depth case studies from Asia, Africa and the Middle East, Ambassador Ahmed will ultimately argue that the inability for Muslim and non-Muslim states alike to either incorporate minority groups into a liberal and tolerant society or resolve the "centre vs periphery" conflict is emblematic of a systemic failure of the modern state - a breakdown which, more often than not, leads to widespread violence and destruction. The violence generated from these conflicts will become the focus, in the remainder of the 21st century, of all those dealing with issues of national integration, law and order, human rights and justice. Under the baking sun of Sinai early last month, a group of Eritrean refugees with little food or water had been stranded at the border between Egypt and Israel for over a week, attempting to cross the border. They huddled together beneath the feeble shade of a sheet of plastic that they held aloft. While Israel barred entry for all but three in this group, an action which provoked an outcry from the human rights community, the more fundamental question lies with the underlying cause for their exodus. Eritrea, divided between Christian Tigrinyans in the central highlands and a number of Muslim tribes in the lowlands on the periphery, is consistently regarded as one of the most repressive states in the world. Under President Isaias Afewerki, a Tigrinyan who has been in power since Eritrean independence from Ethiopia in the early 1990s, the country has become a highly militarised, one party state with severe restrictions over the press, speech, and even movement, particularly in the wake of the bloody border war with Ethiopia from 1998 to 2000. Political opposition and journalists are frequently jailed for voicing dissent, with four journalists recently dying in prison after years of incarceration. The practice of religion is severely restricted for both Muslims and Christians. Since 2002, indefinite military conscription or national service has become mandatory for both men and women between the ages of 18 and 50. Deserters or those suspected of opposition to the government are imprisoned under harsh conditions and subject to torture and forced labour. Those who successfully escape leave their family behind to face punishment in their stead. Eastern Sudan around Kassala, lying near Eritrea's western border, has been the destination for the majority of Eritrean refugees since the 1960s, especially the Muslim Beni Amer tribe of the western lowlands who share kinship links across the border and have formed a large segment of the refugee population. 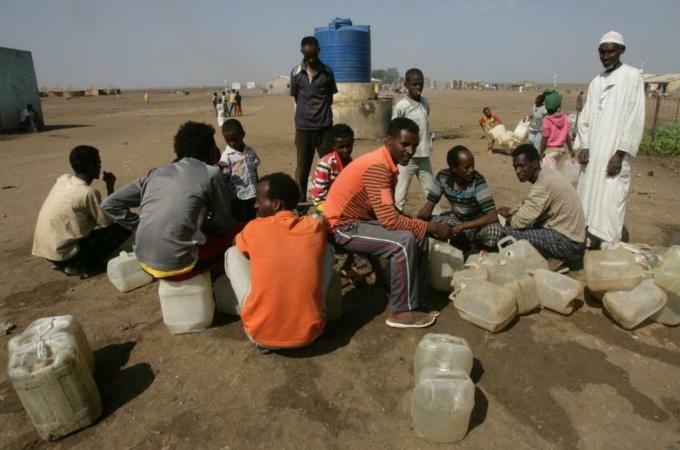 70,000 Eritrean refugees remain in Sudan with more arriving each month. In recent decades many have found their way into Egypt where they attempt to reach either Israel or Europe, with many either falling victim to human trafficking among the Sinai Bedouin or finding themselves struggling to survive in an unwelcoming host country. To more fully understand the impulse of the Eritrean government towards militarism and the cause for Eritreans' flight abroad, we must look to its history as a region involved in a thirty year war for independence, one of the longest conflicts on the African continent. The region of present-day Eritrea, lying at the mouth of the Red Sea, has been a strategic piece of coastline for millennia, having been variously ruled by the historical Aksum Empire, the Ottomans, and local sultanates. Its modern borders with a diverse ethnic population were not established until Italian colonisation in the late 19th century through a treaty with the Ethiopian Emperor Menelik II. Italy called Eritrea, Colonia Primogenita, or "first colony", and sought to create a more industrialised colony as a base of operations for further colonial expansion in the Horn of Africa, particularly Italy's brutal occupation of Ethiopia in the 1930s which resulted in the deaths of 760,000 people. Eritrea, emerging from British occupation of the Italian colony after World War II, became an autonomous unit in a federation with Ethiopia in 1952 as a result of a UN resolution. Many Muslim leaders opposed this federation with a Christian-dominated country and unsuccessfully advocated for independence. The Ethiopian government under Emperor Haile Selassie began to undermine Eritrean autonomy in 1956 by temporarily suspending its elected assembly. Eritrean political parties were proscribed with many leaders jailed or forced into exile. Amharic, the language of the Ethiopian centre, was established as the sole official language. On November 14, 1962, the federation of Ethiopia and Eritrea was officially dissolved with Eritrea becoming Ethiopia's 14th province. Violence between Eritrea and the Ethiopian centre was, however, first sparked prior to this, in 1961, by Hamid Idris Awate, a tribal leader from the Beni Amir tribe, when he clashed with Ethiopian police as they began rounding up potential troublemakers. Hamid Idris had been a notorious raider since a blood feud was sparked over a cattle theft involving a rival tribe in 1942. In these acts of resistance, Hamid Idris garnered the support, largely due to tribal connections, of the Eritrean Independence Movement (ELM) in Cairo, consisting of Muslim leaders in exile, although Hamid Idris would die the following year. The organisation which formed from Hamid Idris' initial resistance was called the Eritrean Liberation Front (ELF). The Beni Amir dominated its ranks relying on the ELM for financial and arms support and tribal links for growing its ranks. The Beni Amir and its supporters resisted participation from other ethnic and religious groups such as the Christian Tigrinyans in the highlands. The ELF's numbers grew as Ethiopian reprisals increasingly took the form of civilian persecution and attacks. In the early 1970s, the Ethiopian air force began systematically bombing villages in western Eritrea, and moving the army into ELF areas, burning villages and executing or detaining anyone suspected of collaborating with the rebel group. During the 1970s, as many as one million Eritreans were displaced, roughly one-third of the entire population. Many began to flee into eastern Sudan. Communism took hold in Ethiopia when military officers under Mengistu Haile Mariam supplanted Haile Selassie in 1974 and established the government of the Derg, meaning "committee". Mengistu decided on a policy of total military defeat for Eritrea and continued the attacks against the civilian population. In 1975, the Ethiopian military began a new campaign, razing and burning villages thought to be giving aid or shelter to the guerilla forces, bombing villages, and destroying food crops and livestock. The 1975 massacre at Umm Hajer in western Eritrea, in which the entire village was destroyed, drove nearly 40,000 refugees into Sudan in one week. The Ethiopian military campaigns not only affected the Muslim population but also the Christian Tigrinyan population who had increasingly been seeking to join the resistance movement. In 1970, the predominantly Christian Eritrean People's Liberation Front (EPLF) was formed under the leadership of Isaias Afewerki as a breakaway organisation from the ELF after conflicts with the ELF's Muslim leadership. In 1972, a civil war which lasted two years broke out between the EPLF and the ELF simultaneous to fighting against the Ethiopian military. The EPLF slowly came to dominate the war. In 1980, the EPLF launched another attack on the ELF and drove its ranks into eastern Sudan in 1981, where many of the Beni Amer and other refugees remain today. The EPLF now assumed hegemony over the Eritrean fight for independence. It was finally able to achieve de facto independence in 1991 and de jure independence in 1993 through mobilising practically the entire adult population of Eritrea for its fighting force. The EPLF re-named itself the People's Front for Democracy and Justice and formed the new Eritrean government, with Afewerki as its head of state. After 30 years of armed struggle, 65,000 Eritrean fighters and 40,000 civilians had been killed. The transition from a guerilla movement to a functioning modern democracy would eventually be stalled by leaders more familiar with the field of battle than the halls of government, with the refugee crisis continuing to linger after independence. For Eritrea, a country that has known so few years of peace over the past fifty years, dialogue with its neighbours and development for its people, rather than further confrontation and military build-up, is needed more than ever. President Afewerki should work to grant his people the promises of freedom in a modern democracy that they struggled so hard and so long to achieve. By addressing the plight of his people at home, Afewerki will not only help to solve the refugee crisis but make his country stronger and more legitimate both in the eyes of the international community and in the eyes of Eritreans. Professor Akbar Ahmed is Ibn Khaldun Chair of Islamic Studies at American University in Washington, DC and the former Pakistani High Commissioner to the United Kingdom. Harrison Akins is the Ibn Khaldun Chair Research Fellow at American University's School of International Service and is assisting Professor Ahmed on Ahmed's forthcoming study, "The Thistle and the Drone: How America's War on Terror Became a Global War on Tribal Islam", to be published by Brookings Press in January 2013.